The summer exhibition will present a unique opportunity for visitors to see key works by five artists who studied under David Bomberg as part of the Borough Group. The artists; Dennis Creffield, Cliff Holden, Edna Mann, Dorothy Mead and Miles Richmond, were all members of the Borough Group studying at Borough Polytechnic (now LSBU) under Bomberg in the mid-1940s and early 1950s. The exhibition will juxtapose two significant works from each artist with recorded oral histories from the British Library Sound Archives, recollections from families and peers, a visual timeline and an interactive website. For the first time, visitors will be able to use the gallery as a space for study and investigation to explore and understand the importance of the Borough Group within a broader post-war context. The timeline and archive materials locate the artists' careers within the development of art movements, institutions and changes to British art education, thereby emphasising their place within the evolution of modern art in Britain. 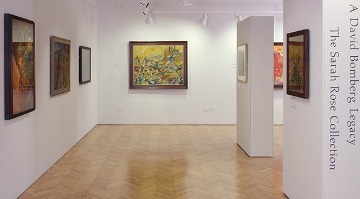 The exhibition draws upon the significant resource of the paintings, drawings and prints in A David Bomberg Legacy – the Sarah Rose Collection, donated in trust to the University. It demonstrates the University's commitment to developing new cultural research for both academic and non-academic audiences. Rachel Fleming-Mulford, Curator of Borough Road Gallery comments: "This exhibition will shed further light on the richness of Sarah Rose's collection and the careers of these five artists within the post-war London landscape. The oral histories and visual timeline offer a fresh interpretation on how these artists worked, the influence of their peer group and the key exhibitions that defined their early careers." Thursday 12 June 2014, 7-8.30pm: Miles Richmond: The Colour of Energy. Talk by Andrea Gates, Director and Archivist at Messum's Fine Art. Gates will discuss Miles Richmond's Millennium Commission mural, sited in the London Road Building, at London South Bank University. Gates will elucidate upon Richmond's work and technique, the development of which culminates in this mural: one of the highlights of his career. Wednesday 25 June 2014, 7-8.30pm: Researching Residencies: Artists and the Archive. This panel discussion will delve into the exciting ways in which artists are responding to archives and collections, using them as research tools to inform their own art practice.